Drone testing in Boulder City is off to a slow start, but state officials are confident that future clients will bring their unmanned aerial vehicles to the desert. Tom Wilczek, aerospace and defense industry representative for the governor’s economic development office, said the Federal Aviation Administration is taking its time distributing certificates of authorization for drones because it wants to make sure all of the details are ironed out. “As soon as they start operating, they don’t want anything bad to happen because it would push back the program,” Boulder City Municipal Airport Manager Kerry Ahearn said. Boulder City was picked as one of four Nevada test sites in December, but the process for testing drones was delayed four months while the FAA met with state representatives to discuss blueprints and safety issues for the industry. “I think the FAA has always been very safety-conscience and safety-focused,” Wilczek said. Those public entities granted authorization can use drones to take pictures of homes, for agricultural and research methods, public safety and recreational purposes, Ahearn said. 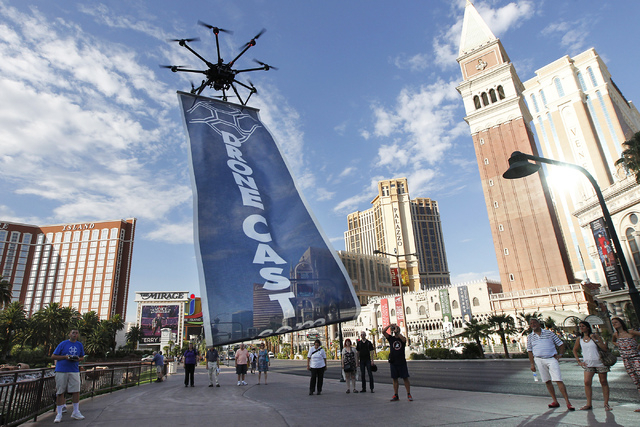 Nevada was the third state to be designated as a testing site for drones. Boulder City, Fallon Municipal Airport, Reno-Stead Airport and the Desert Rock Airport at the Nevada National Security Site are the state’s four testing sites. Alaska, New York, North Dakota, Texas and Virginia also were designated for drone testing. Wilczek said once the FAA grants more certificates, Boulder City will see an increase in drone testing if it appeals to potential clients. Location and proximity to their home base are crucial to some clients, he said. Despite the FAA’s reluctance to issue certificates to operate drones, Boulder City has made a strong effort to bring unmanned aerial vehicles to town. City officials met with companies in May in Orlando, Fla., to gain more information about the industry. In 2013, Nevada agreed to work with the Canadian province of Alberta to strengthen relationships and promote technology development between the two partners. Once the drone industry gains more steam, relationships between Nevada and Alberta will be more productive, he said. “If we’ve got companies in Nevada that want to test in colder climates, we’ll send them their way. And if they’ve got companies that want to test in a warmer climate, they’ll send them our way,” Wilczek said. Despite Nevada’s partnership with Alberta and its future companies interested in unmanned aerial vehicles, the FAA still has the final say when it comes to distributing certificates to operate. According to Wilczek, the FAA’s time line for success in the beginning of the year was issuing one certificate to any of the six designated states by the end of June. It met that challenge in May when North Dakota was the first state granted a certificate of authorization. Although Boulder City is still awaiting its approval, Ahearn is confident the city will reap the benefits of the drone industry. It’s a matter of when the FAA chooses to issue more certificates. “It’s taken longer than expected, but hopefully it opens the door for others to come in and operate,” she said.